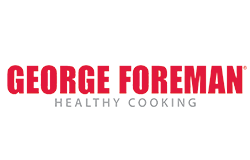 George Foreman grills are insanely popular electric grills manufactured by Salton Inc. This brand of grills was originally launched in 1994 and endorsed by retired boxing champion George Foreman as an indoor electric grill that helped reduce fat content from meats by enabling the drippings from the meat (a.k.a. fat) to be drained away while the food cooks. 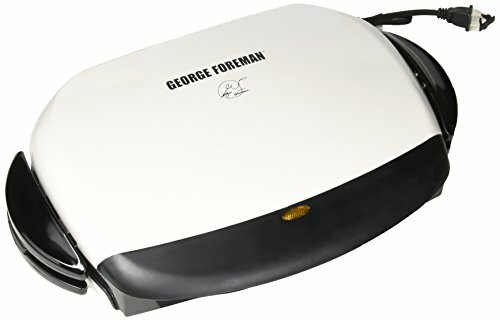 As its popularity and reputation grew, the George Foreman brand has expanded to include other models that can be used indoors and outdoors. The George Foreman GRP4-1 is a versatile grill that offers a lot of exciting cooking opportunities. Its 72-square-inch cooking surface allows you to cook up to 5 portions at a time. But the thing you’ll like most about it is its cooking speed. It cooks chicken breasts in about 8 minutes, fillet mignon in 5 minutes, and steaks in 6 minutes – about a third of the time a stovetop grill takes. You can also use the grill to make toasted sandwiches. It lightly toasts bread and melts cheese and other fillings without soaking the bread in fat (as is the case with traditional sandwich makers). The only downside is that you’ll only be able to make 2 sandwiches at a time and the grill won’t seal the edges of the sandwiches like sandwich makers do. Unlike the older Foreman grills, this grill has 1000 watts of power and an embedded heating element that makes sure heat spreads evenly across the cooking surface. Don’t feel like cleaning up after eating? No problem. Just wipe the grill with a damp cloth after use and wash the removable plates in the dishwasher. This grill makes cooking, serving, and cleaning up extremely easy. If you have a limited budget or you’re a busy professional who just wants a quick and compact grill that can make an assortment of dishes, the George Foreman GR144 is willing to step up to the plate. It cooks food in minutes and provides heat to the top and bottom at the same time. The grill has a large surface for cooking which covers 144 square inches. You can make food for 9 people at a go. The food you make on this grill will be tasty and free of unnecessary oil. It is very good at keeping meats moist and your steaks and chicken breasts will be more succulent. A drip tray catches all the drippings, decreasing the amount of time you take to clean up. The tray is removable and can be washed in a dishwasher. Your teens will love using this grill after school as they don’t have to wait for a long time for their delicacies to cook. You’ll also love the fact that there is no giant mess for you to clean up. The non-stick surface wipes clean in seconds, simply use a damp cloth or sponge as soon as you finish cooking. A health grill is a great kitchen asset. It does a fantastic job of grilling fish or fillets and cooking chicken breasts and steaks. When it comes to grilling at home, George Foreman is still the go-to brand. 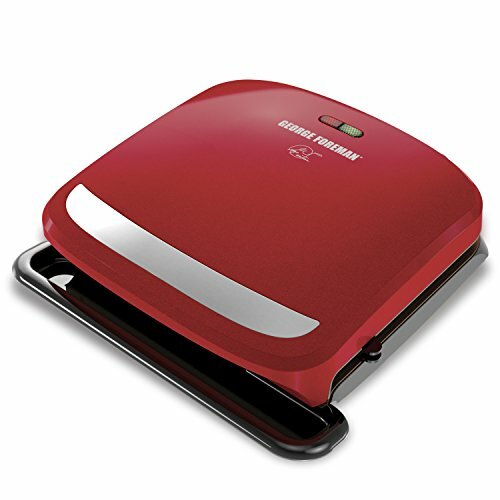 We love the George Foreman GR20B as it can cook for a small family or for two. You can also cook food for large groups, but you’ll have to cook in batches. The unit has grill plates on its top and bottom which eliminate the need for turning food when grilling. The grill can cook tasty pork chops, burgers, and vegetables. It is quick to heat up and the heat spreads evenly across the grilling area. Its 60-square-inch grilling surface can fit about 2 chicken legs,2 medium-sized paninis, or 2 hamburgers at the same time. The cooking surface is tilted to ensure grease and oil drip into the drip cup. 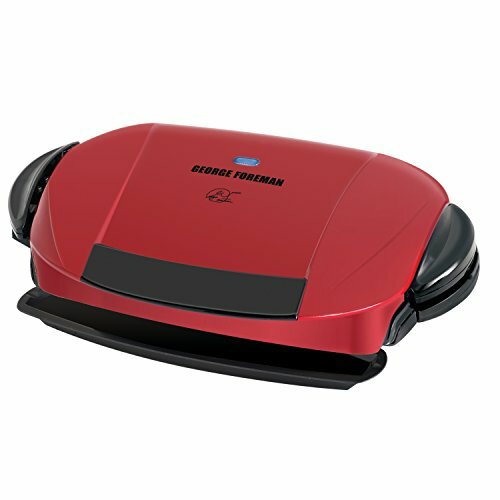 George Foreman understands that cleaning up can be a hassle and has designed this grill to be very easy to clean. After using it, wipe it down with a damp sponge or paper towel. Be sure to do this while the grill is still hot as the task will be easier. Some ingredients may stick to the surface and will be more difficult to remove, but this shouldn’t worry you. Simply let the grill get hot and use a damp cloth to clean it. Alternatively, you can use the cleaning tool provided by George Foreman. When former boxing champion George Foreman partnered with Salton Inc. and launched his first health grill back in 1994, it was the first of its kind. While other manufacturers have joined the bandwagon and created similar grills, George Foreman grills are still the best. They can sizzle salmon, sear steaks, toast sandwiches, and grill chicken breasts. Have a scrumptious meal in mind?Chances are a George Foreman grill can make it. George Foreman grills are all about simplicity and healthy grilling. We love this one in particular because it fits 4 portions and is perfect for small families. It is not complicated to use, simply plug it in and turn it on. It will heat up for a while and when the temperature becomes ideal for cooking, its indicator light will go off. The other light shows when the grill is plugged in and ready to use. The slanting design helps get rid of grease and fat released by food when cooking. A 1-inch floating hinge ensures the grill accommodates large foods and cooks them perfectly. The unit is very easy to clean. After each use, wipe it down with a paper towel. Afterwards, remove the grill plates and drip tray and wash them by hand or in the dishwasher. 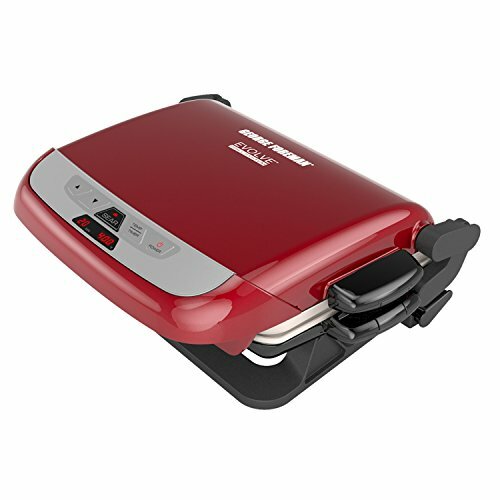 George Foreman makes four types of grills: basic grills, premium grills, advanced grills, and indoor/outdoor grills. Basic grills are small and don’t make many servings at a go, advanced grills have removable plates, premium grills feature the latest technology (like searing and broiling features), and indoor/outdoor grills have removable stands and large grilling surfaces (they make up to 15 portions). 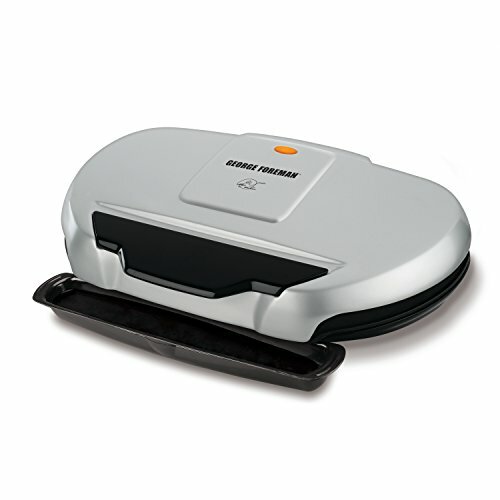 The George Foreman GRO103B Grill falls in the basic category. 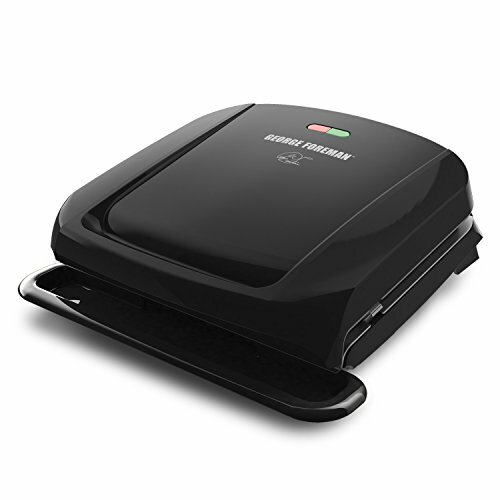 It is the original George Foreman grill that made the company so popular. 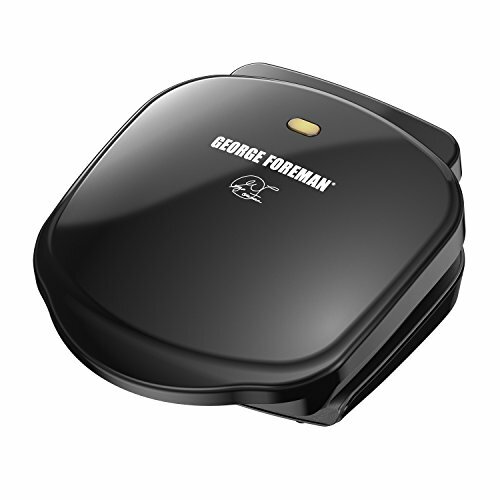 It has three features that can be found on all George Foreman grills: tough non-stick coating, a fat-removing slope, and a drip tray. The non-stick coating is very easy to clean and ensures you use very little butter or oil when cooking. The slope gets rid of extra fat from food (you’d be surprised to see how much oil a burger has) for healthier, tastier meals. The drip tray gathers all the fat and grease for easier cleaning. The grill only fits 2 servings and is perfect for couples or those who have limited space. However, do not look down on its small size because it grills just as well as the bigger George Foreman grills. Hard-wearing grill plates provide awesome grilling power for all your favorite foods. The first George Foreman grill transformed the way people grill forever. Many grills have come after it, but the company has never veered off course. Its new grills are even better than the old models. 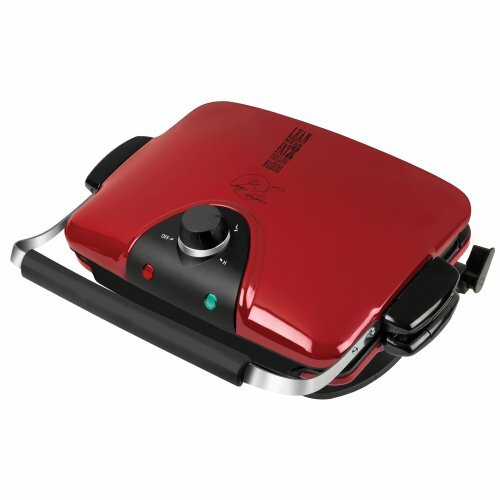 One of its newer indoor grills we can’t help but love is the George Foreman GRO103B. It is a great grill – whether you want to cook a little healthier or enjoy some delectable steaks with friends. The GRO103B Grill has embedded heating elements that ensure even heating from the center to the sides. Cleanup is an easy task as some accessories can be cleaned in a dishwasher. The non-stick cooking surface is also easy to clean, simply wipe it clean with a damp cloth after use. 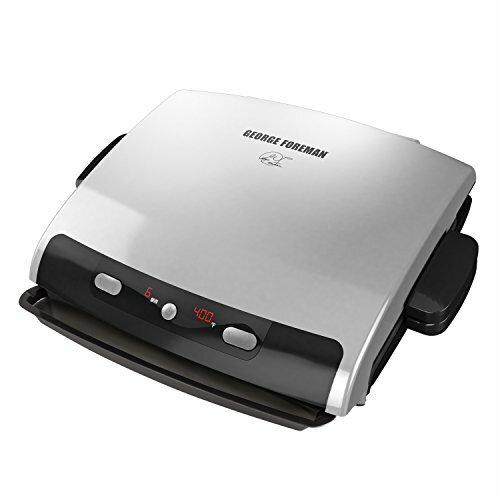 If you’re looking for a grill that doesn’t use gas or charcoal, the George Foreman GFO240S fits the bill. With an expansive cooking surface that spans 240 square inches, it is perfect for backyard barbeques and tailgate parties. The grill has a domed lid that traps steam and prevents your steaks and burgers from getting dry. We love the pedestal that turns the grill into a standalone unit you can use on the deck, patio, or by the poolside. If it starts raining, there’s no need to end the party. Simply remove the grill from the stand and take it indoors to cook on a countertop. 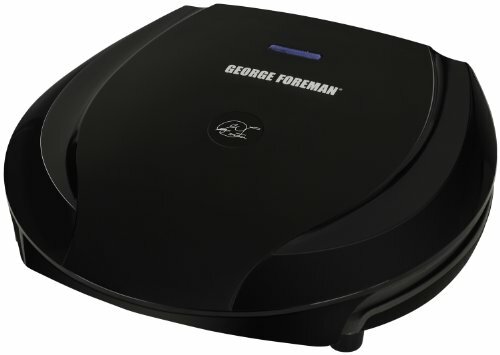 Like all George Foreman grills, this one has a fat-removing slope that gets rid of almost half the fat. Its tough non-stick coating is hard-wearing, easytoclean, and does away with the need for excess butter and oil. You’ll also love the drip tray that does the hard work of collecting extra fat and grease. This is a great grill for those looking for an affordable grill or a grill that can be used indoors and outdoors. You can use it outdoors all summer long then move it indoors when the weather turns sour. Do you love starting your day with delicious food and ending it the same way? If you answered “yes,” consider getting this grill. It can cook almost everything: ciabatta rolls, burgers, sausage patties, chicken breasts, pork chops, and much more. The unit comes in an attractive red color and is easy to flip open and close. The grill can cook 5 portions at a time and makes your job easier if you have a large family. If everyone wants to eat something different, no problem! Simply make 5 servings of their favorite food without breaking a sweat. It’s hard not to love its spacious cooking surface as there’s so much it can do.A temperature indicator light on top lets you know when it’s perfectly preheated. Unlike the old George Foreman grills, it has removable plates that can be washed in a dishwasher. If you normally hand wash your dishes, be careful when washing the grill plates as the non-stick coating can erode over time. If you’ve used a George Foreman grill before, you must be familiar with the sloping grill surface – it’s the telltale sign of a George Foreman grill. It helps get rid of up to 42% of fat from any food you cook. What could be better than drinking a hot cup of coffee and eating freshly baked muffins on a chilly morning? Not many things. If you want a grill that can make muffins in the morning, sandwiches for lunch, and meatballs for dinner, this is it. It is one of the best grills George Foreman has ever made. The 4-in-1 unit can function as a grill, a muffin pan, a bake dish, and a panini press. It makes 5 servings at a go and is perfect for cooking family meals everyone will love. Your food won’t be soaked in oil as the grill gets rid of 42% of the fat, draining it into its drip tray. George Foreman understands that great cooking boils down to cooking temperatures and has included a digital control panel on this grill that shows the cooking time and temperature (which ranges between 325°and 450°). There is also a special knobfor the 500° searing burst. The grill has a 22-square-inch cooking surface and allows you to make different types of foods thanks to its multiple plates. You can even buy additional plates separately.Its adjustable hingemakes for better cooking of both large and small foods. As the name suggests, this small tabletop grill cooks up to 4 servings at once with its 60 square inches of cooking space. This electric grill has removable grill plates that are dishwasher-safe for easier clean up after each use. The grill plates also have nonstick coating that enables you to cook food without butter or oil as well as protects the plates when you’re cleaning. This feature ensures that the plates are durable enough to withstand constant grilling and cleaning. Another good feature of this grill is that it heats up 35% faster than previous models so you can expect your meals to be ready in about 10 minutes. While the grill does excel in grilling, there are a few disadvantages that should be taken note of. It has a short power cord which means that you can only place it near an outlet. Another disadvantage is that it lacks an on and off button so you can’t afford to leave it plugged after every use. Lastly, there’s no temperature control so you don’t exactly know how hot the grill is and how long you’ll need to use it to ensure your food is cooked through. Delicate meat like fish and chicken will need to be watched carefully while cooking to ensure that it doesn’t get overcooked. If you’re looking for deliciously grilled meals that are done quick and easy for a family of two to four, this may well be the one you’re looking for. 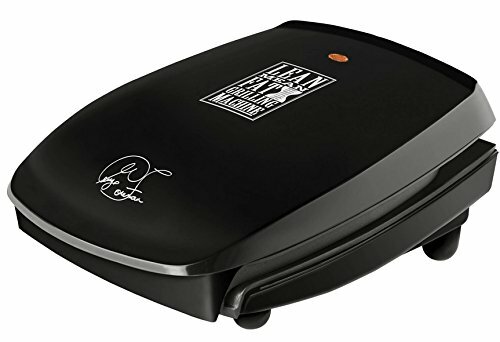 If you’re looking for something that cooks just a bit more than 4 servings, there’s another George Foreman grill that may have what you require. This Next Grilleration 5-burger Grill has 72 square inches of cooking space which can fit 5 servings at a time. Like the previous grill, this one also has a durable nonstick coating that enables greaseless cooking and provides protection to the plates while cooking. Also, this grill has removable plates that are dishwasher-safe. this grill has the patented sloped surface to ensure the drippings fall down the drip tray instead of staying on the grill. A nice feature that this grill has is the floating hinges. This means that you can cook various foods of varying thickness at the same time and the grill will hold them tight so you can be sure that both sides of your food gets cooked evenly. Are there any drawbacks? Yes, there are a few. Even with the 1000 watts of power, the grill takes a bit of time to heat up (around 15 minutes or so). And there’s no temperature control, just a light that will tell you that the grill is at the right temperature for cooking. Lastly, there’s no on and off switch so you’ll need to be aware of unplugging the grill after every use. Overall, this 5-Burger Grill is still a good investment at less than $50. You still get to cook your food really fast (less than 10 minutes) once the grill is hot enough for cooking. If you’re looking for convenience and speed as well as a bit more grilling space than just 4 servings, this just might be what you’re looking for. There are several similarities between the GRP90WGR model and the previous grill we reviewed. This model also has 72 square inches of cooking space for you to enjoy, removable plates that are dishwasher-safe, and non-stick & non-scratch coating. But that’s where the similarities end. And that’s actually a good thing because it’s the differences that make this a better choice if you’re looking for a bit more versatility with your electric grill. With the GRP90WGR model, you get 5 removable grill plates instead of the usual two and this is where the versatility comes in. You get 2 grill plates, 2 waffle plates, and a griddle or deep dish tray. No need to buy additional accessories because this grill already has them. The plates are easy enough to switch out which makes things even better. So now, you can cook waffles for breakfast, paninis or quesadillas for lunch, a steak for dinner and some cookies for dessert all with one kitchen appliance. Another great feature of this particular grill is the temperature control. It’s a knob that has a 1,2,3 setting which means low, medium, and high. I know it’s not an ideal way to control temperature but it’s better than nothing, right? Also, there’s a red light that shows you when the power is on plus a green light that turns on when the grill is heating up. Once the green light shuts off, you’ll know that the grill has reached your desired temp. The same knob used for controlling temperature is used to shut the grill down so just turn it to OFF to stop the grill from heating up or staying hot. Is there anything to dislike about this grill? Not much. While the plates are fairly easy to clean, you’ll need to be sure that you do clean them thoroughly and carefully so as not to damage the non-stick coating. The top grill plate, however, may be a tad more difficult because it has a crosshatched design. Another thing to take note of is possible hot spots on the grill that may cause your waffles to come out unevenly cooked. The only remedy is to watch your waffles closely as they cook or at least until you get the hang of it. The verdict? Definitely worth the price. As always, cooking with a George Foreman grill is quick and easy. With the versatility of the interchangeable grill plates and the addition of the temperature control, you really get more than what you pay for. This countertop grill is one of the best from the George Foreman brand. This grill has several features that are trademarks of the Foreman line such as the non-stick, dishwasher-safe removable plates that we all love. It also has the patented sloped design that allows the fat and oil to drip away from the food, into the drip tray. And, it has the clamshell design to ensure that both sides of the meat cook evenly and keeps splatter from making a mess on your counter. Lastly, it has a floating hinge so you can easily fit in thick pieces of meat. But what makes it stand out from the others? Several things, actually. The GRP99 has 108 square inches of cooking space so you can fit around three large steaks or six small burgers at a time. Another great feature is the digital timer with an easy-to-use touch control so you have more control with your grilling. As an added bonus, you also get real temperature control that lets you program exactly how much heat you need to grill your food. Overall, this is a great addition to your kitchen. You get enough cooking space to feed a family of 3-4, no mess cooking, and easy clean up afterwards. The best part? You get more control in cooking with the timer and temperature settings. Definitely a lot of bang for your buck. 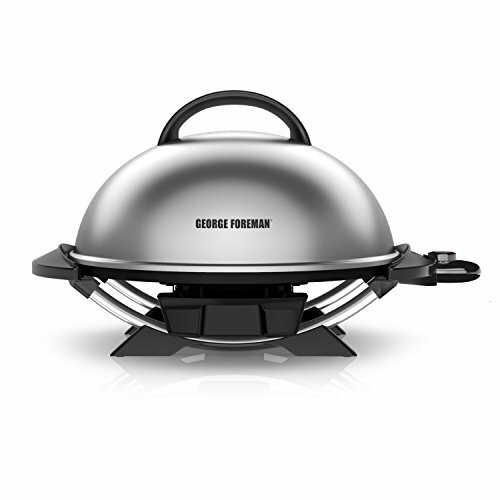 The GGR50B is an acknowledged bestseller in the best George Foreman grills line. And that’s not without cause. While a lot of the Foreman grills are contact grills, this one is more old school using convection type grilling. 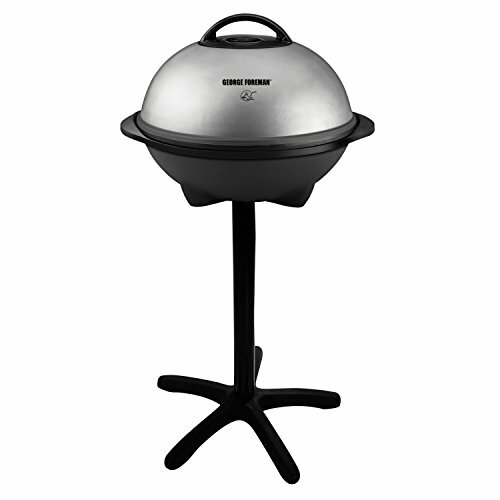 The grill has a high domed lid and adjustable steam vent just like traditional charcoal grills. This is actually perfect for “bulky” types of food that just don’t fit well with contact grills such as pork roasts, whole corn, and large bone-in chicken breasts. And unlike the other grills, this one was specifically designed to be used both inside and outside. You can either place it on your counter for some indoor grilling (perfect for cold weather) or prop it on the pedestal stand for some outdoor cooking (summer grilling at its finest). It has 240 square inches of cooking space so you can easily grill four large steaks at a time. Easy clean up because the grill plate is removable and has non-stick coating. The patented sloped design along with a center channel allows the grease and oil to drip down into a grease pan. grease pan needs to be cleaned out after every use because the drippings can spill on your floor and potentially create stains if overloaded. If you have uneven floors, the grease may not drip properly into the pan and potentially stain your floor. At the very least, you will have more things to clean up after you cook rather than just your grill plate and pan. requires ample counter space if you want to grill indoors. If you live in an apartment complex or condo that doesn’t allow for open flame grilling, this is a great alternative for you. It has the necessary parts to enable you to enjoy traditionally grilled meals fast and easy. The clean up afterwards is no big deal either. While there are some aspects about this grill that I might wish to change, it’s still a very good one for its price.